An accelerometer is a device that measures acceleration of hardware. Acceleration is the rate at which velocity of a body changes with time. 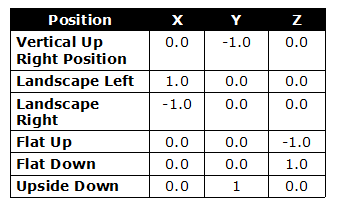 It is used for detecting the changes in the position of a device in the three directions x, y and z, revealing the current position of the device relative to the ground in terms of these co-ordinates. The accelerometer is a built-in electronic component that measures tilt and motion. It also perceives motion gestures such as rotation, swinging or shaking. 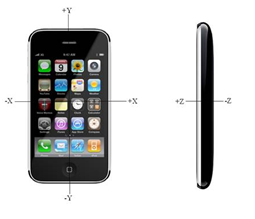 The accelerometer in iPhone and iPod touch measures the acceleration of the device relative to freefall. A value of 1 indicates that the device is experiencing 1 g of force exerted. 1 g of force is the gravitational pull of the earth, which the device experiences when it is stationary. The accelerometer measures the acceleration of the device in three different directions X, Y, and Z . When the device is held upright and moved to the right quickly, the value of the X-axis will increase from 0 to a positive value. If it is moved to the left quickly, the value of the X-axis will decrease from 0 to a negative value. When moved upward quickly, the value of the Y-axis will increase from -1.0 to a larger value and when moved downward quickly, the value of the Y-axis will decrease from -1.0 to a smaller value. If the device is lying flat on a table and then dropped, the value of the Z-axis will decrease from -1.0 to a smaller number. If it is moved upward, the value of the Z-axis will increase from -1.0 to a bigger number. SPEC INDIA is a boutique ISO 9001:2008 certified software solutions company with 27 years of consistent and sustained growth implementing critical business systems at Multi-location providing enterprise solutions for Fortune 100 corporations with core expertise in multi platform enterprise mobility solutions providing well established to manage 365x24x7 critical maintenance support. All the projects at SPEC INDIA adhere to Quality Assurance practice in line with ISO 9001:2008.
iPhoneQualityApplications offers iOS applications and iOS solutions using iOS 7, iOS 6 and iOS 5 to work on a range of Apple devices; iPhone 4, iPhone 4S, iPhone 5, iPhone 5C, iPhone 5S, iPad 2, the iPad Air and iPad Mini. The iOS applications development team works in close co-ordination with the design team to deliver simple, elegant and capable iOS software by exploiting the groundbreaking frameworks of iOS like UIKit, Core Graphics, Core Animation, Core Data, Foundation and Game Controllers. After the successful launch of Apple Inc’s iPhone 5S and 5C in the November month, the device had captured more that imagination smart phone lovers from India. The sale had hit the market as many popular telecom operators like Reliance, Airtel and Vodafone had brought attractive plants for users. On the other hand, Samsung Electronics' new Galaxy S4 and Galaxy Gear had not attached much India buyer’s. According to Imagine, Apple reseller executive from South Delhi mall said, "We generally use to keep around 100 units of devices for seven days. But after the launch of iPhone 5S and iPhone 5C, we have to update stocks every two days." The sales increased mainly because of buyback and EMI offers. 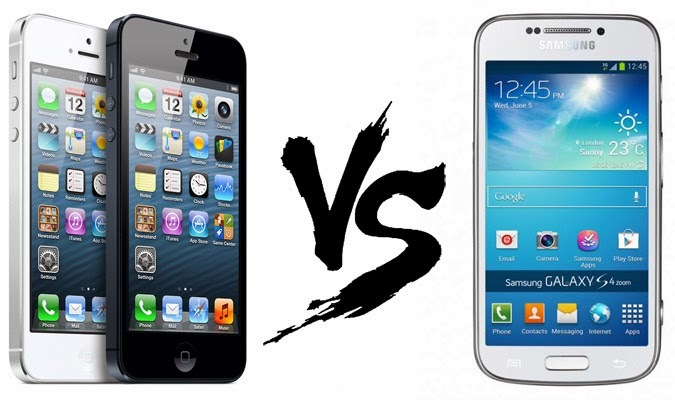 Some of the sources claim that gradually new Samsung S4 is losing out its new fight between the two Apple’s smartphone giant. But if we see that overall sales of smartphone then Apple is still a challenger when compared to market leader Samsung. After seeing the success of Apples iPhone5S, today Taiwanese smartphone lunch its latest HTC phone with fingerprint scanner. The new HTC One Max’s fingerprint scanner is placed on the back of the phone which is just near to camera. However, new feature are not like iPhone 5S, with the fingerprint scanner users can not only unlock the phone but also configure the scanner to open the camera app when they use the left index finger and a browser with the right thumb. 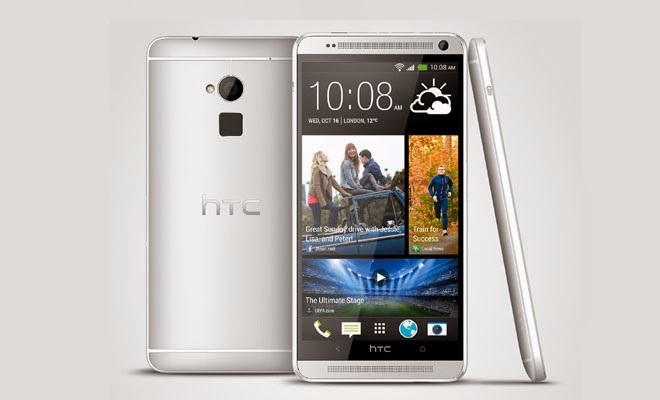 From all HTC One’s series the new One Max is most expensive phone and larger in screen size, with a price tag of Rs 56,490. It has a 5.9-inch screen and weighs 217 grams. The smartphone is available in two storage sizes, which are in 16 GB and 32 GB. It has 3,300 mAh battery power which gives up to 25 hours of talk time. The phone runs on Android 4.3 Jelly Bean which is new Android OS. The processor is Qualcomm Snapdragon 600 1.7 GHz quad-core and the phone has 2 GB RAM. After a long waiting, Canadian smartphone maker BlackBerry has at last announced its BBM service for Android-based handsets and iPhones. After a month long wait BlackBerry announced that BBM App for Android and BBM for iPhone are ready to download and install, not all users will be able to start messaging right away. 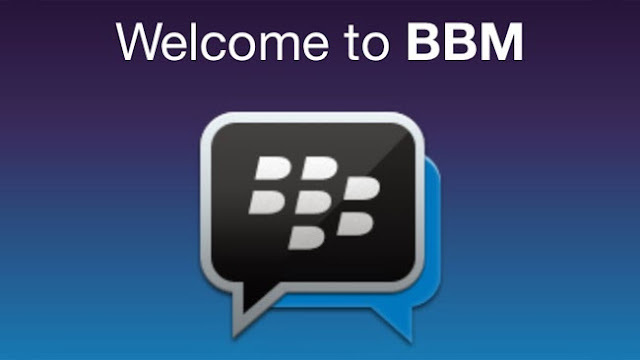 Last night company’s official blog say’s as : “It’s the news you where waiting for... now officially resume our rollout of BBM for Android and iPhone customers around the globe!. In the next few hours, people will start seeing BBM in Google Play, the App Store and in select Samsung App Stores. It will be first time the cross-platform offering will be available for general public. BlackBerry said last week that 6 million Android and iPhone customers had pre-registered for the BlackBerry Messenger (BBM) launch and it are those users who will get to use the app first. Now it’s official announced by Apple Inc.'s (AAPL) that the latest smartphones, iPhone 5s and iPhone 5c are ready to hit Indian markets in less than three weeks. At the same time Apple confirmed that the iPhone 5C will be priced at 41,900 rupees ($680) and the iPhone 5S is expected to be sold at INR53,500 (US$868) for the 16-gigabyte model. India’s leading telecom providers Reliance Communications and Bharti Airtel has unveiled the launch date as November 1, 2013 for Indian customers. Though in the company clams that the iPhone 5C is the lost cost model, at the same time which is very much similar to another Android smartphones and may be costly to Indian customers. 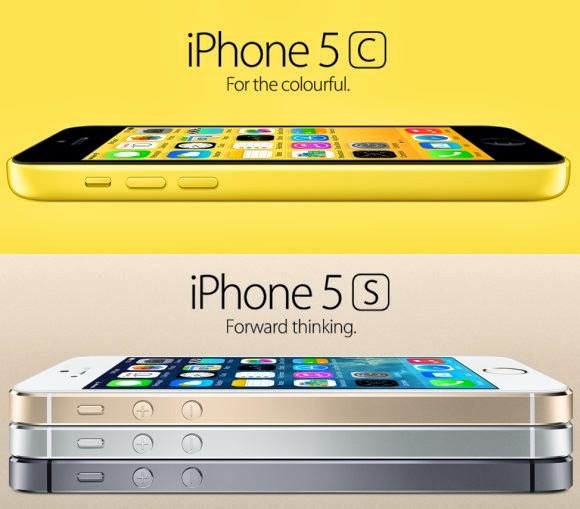 In the earlier month of September, the iPhone 5C and 5S series was unveiled by the Cupertino, Calif. Which is now selling like hot cakes in the International markets. The first report, suggest that total nine million units were sold in the first three days. The popular Airtel network carrier, had started pre-booking for the new handsets. But till now pre-booking stores has still not been confirmed. The India's third-largest telecom company Reliance had also opened pre-booking option from November 1. According to the experts, the iPhone 5c will be available at a starting price of Rs.41,900 for the 16GB variant and the iPhone 5S will retail from Rs.53,500. The smart phone will be available in five colors of green, white, blue, pink and yellow while the iPhone 5s can be grabbed in shades of gold, silver and grey. It’s also expected that both the phones will be available in all 16GB, 32GB and 64GB capacities.